Learn about the many study abroad possibilities for you at Webster. It's never too early to plan your study abroad experience! The Office of Study Abroad will host two Open Houses on Wednesday, Aug. 29. A session for students will be held 11 a.m.-1 p.m. in Sverdrup 207. Come find out about Webster study abroad opportunities, scholarships, how to plan, and more. A session for faculty and staff will be held 4 p.m.-6 p.m., also in Sverdrup 207. Food will be provided at both events. 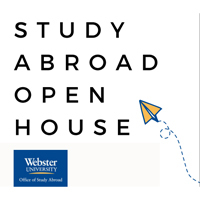 For more information on Study Abroad options at Webster University, as well as various scholarship opportunities, please visit webster.edu/study-abroad.